A tiny spike in the temperature and everyone starts thinking spring- or wishing for it by now. It happens every year so you’d think we’d be use to it. But when that first daffodil pops up everyone goes a little crazy. You’d think we’d never seen one before. But let’s face it. The Daffodil Weekend is a fact of island life. It’s kind of a rite of passage here. But right now I’m in Key West and thinking about orchids. 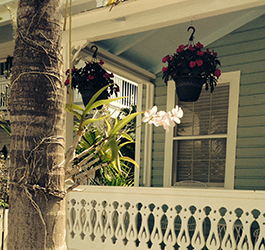 In Key West the orchid is like the daffodils, hydrangeas and roses all wrapped into one. Orchids bloom here all year long and while the hibiscus and the bougainvillea are just as prominent they can’t rival the orchid in popularity. 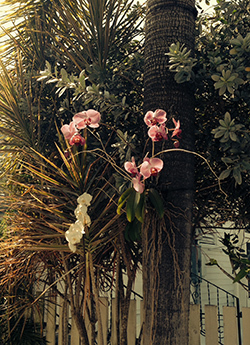 So if you’re having a bit of winter blahs consider an orchid to cheer up your home. It won’t last as long as down here but it will give you a pre-spring boost. Orchids are interesting plants. Here in the south they root right on tree trunks and it isn’t unusual to pass house after house with orchids blooming on every tree in the yard. I love the colors, purple, pale yellow, and most of all white. The white orchid is my favorite. It’s so classy and elegant. All orchids are perennial herbs that lack any permanent woody structure. Some orchids have a single flower but most have a number of blossoms on one stem. When I first arrive one of the things I buy is a single orchid plant. My friend Patricia is a potter and made a wonderful pot for the orchid plant I put in it each year. 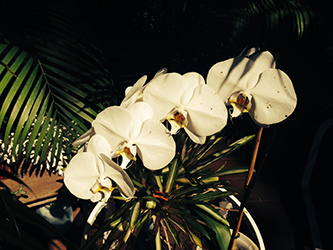 The orchid sits on the outdoor table all winter long. That’s the wonderful thing about orchids – they are hardy. They look delicate, but they don’t take much care. My friend Gretchen has a slew of gorgeous orchids. They always look healthy. They are all around her house and make it seem like springtime year ‘round. While it’s a pleasure to buy fresh cut flowers they don’t last. An orchid just seems right wherever you place it and finding unusual containers is part of the fun of decorating with them. When you consider the fact that all it takes is a small flower for relatively little cost in the scheme of decorating, it’s a good investment. And it will make you happy when you look at it. I move my orchid around from time to time and wherever I plunk it down it looks right. I hate to admit it, but buying an orchid is very satisfying. The other day I was in a home furnishings store. All the tables held containers of orchids as the main accessory in the set up rooms. There were rustic stone bowls holding either a single orchid or two or three. An oversized clamshell seems to be the container of choice in the tropics. I like this look on a side table. The contrast of the elegant orchid in a rustic container is interesting. Another good quality about orchids is that, when used as a centerpiece, it is light and delicate and doesn’t obstruct views. 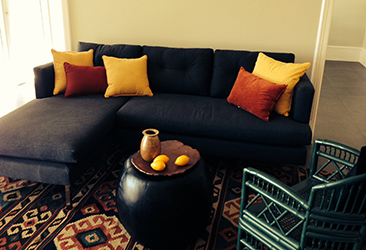 It just happens to be the perfect accent on a coffee table, perhaps on top of a stack of coffee table books or with an arrangement of a small bowl, books and the orchid for height. I took pictures of my orchid as well as those growing right out of the trees in front of my house and others I snapped as I took a walk to town. They are simply everywhere. Maybe this will inspire you to buy an orchid. It will make you happy every time you walk past it. They need air. A ceiling fan can provide gentle ventilation. Orchid potting media should be open with good drainage, yet able to support moisture. Orchids should be watered just as they dry out. A 6” plant should be watered every 7 days. At minimum, thoroughly water once a month. The water should run through.